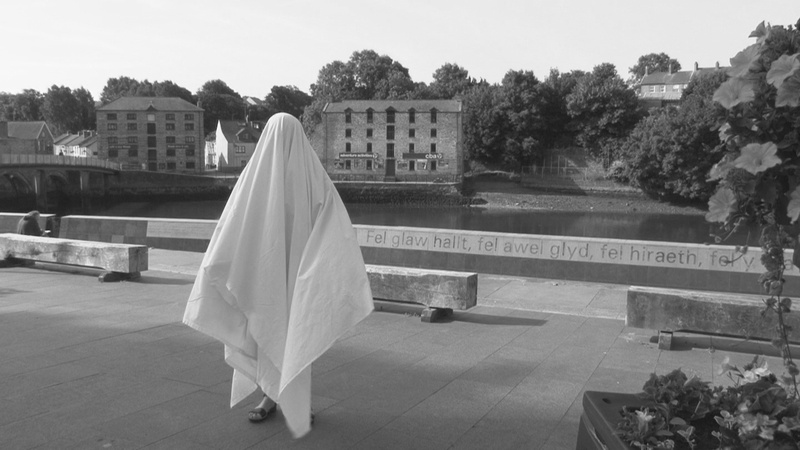 Haunting Places is a series of film works set in landscapes and locations in Wales the first of which, Cwm Cych was screened at the Bodies in Land Festival in May 2014 in Abercych, Pembrokeshire. The first series of nine short films were screened as part of Colony Projects’ Colony 14 Cardigan in the Bridge Warehouse, SA43 3AA. A second series of four films filmed in the Roath area of Cardiff was commissioned by the Made in Roath Festival 2014 and shown as part of the exhibition We cling to the door frame as it all rushes by at The Abacus, Wood Street, Cardiff CF10 1ER between 16 and 30 October. The films are simple video portraits of a sheeted figure standing in iconic landscape/heritage locations. The figure simply stands, the sheet moves in the breeze, life goes on around. The subtexts are subtle and implicit, an observation of the phenomenon of the heritage industry and our contemporary obsession with being photographed next to iconic landmarks.